Have you ever wondered why some concealers work great for some and not so great for others? A concealer that works wonders for your friend may end up looking blotchy on you. Why is this? Believe it or not, your skin type plays a big role in the type of concealer you should use. Dry, oily, combination, sensitive, and normal skin types all have different concealer requirements. When picking a concealer, it is important to consider your skin type. People with dry skin tend to experience a dull or rough complexion, red patches, less elasticity, and more visible lines. Also, when exposed to a dry environment, skin can sometimes crack, peel, or become itchy. It is also possible to suffer irritation or inflammation of the skin due to excessive dryness. All of these conditions are worsened with the use of an inferior or improper concealer. Oily skin types tend to suffer enlarged pores, a dull, shiny or thick complexion, and skin blemishes like blackheads or pimples. It is also common to have blocked pores when one has oily skin and the wrong type of concealer can just worsen this problem. People with a combination skin type can suffer with both oily and dry skin at the same time, but in different areas of the face. Combination skin types typically have an oily T-zone (nose, forehead, or chin) but have normal or dry skin on the rest of the face. This makes it especially difficult to find a concealer that matches their needs. Sensitive skin can react to almost anything, but the majority of the time a reaction is due to skin care products. Redness, itching, burning, or dry skin are all common signs of a reaction. Many concealers are not made for sensitive skin and can cause serious skin problems. Some people are blessed with perfect skin or a normal skin type. Normal skin is not too oily nor too dry. People with a normal skin type also suffer few imperfections, little sensitivity, barely visible pores, and an even complexion. However, even a normal skin type can be affected by the wrong concealer. Consistent use of a low quality concealer may cause breakouts or dry spots where they have never occurred before. Fortunately, our I Conceal line is perfect for all skin types. It treats common skin issues associated with dry, oily, combination, or sensitive skin and is paraben free. 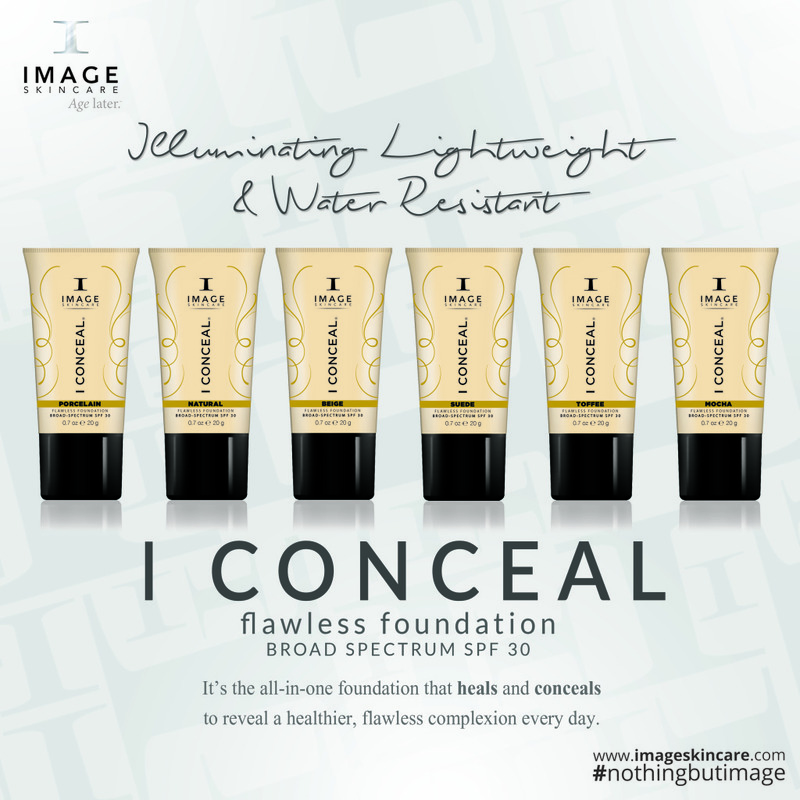 I Conceal truly conceals and helps heal for a flawless complexion. It is indicated for use for the following conditions: rosacea, acne, acne scarring, post cosmetic injection, bruising and scarring, post-laser, or post-surgery. Take the guesswork out of picking the perfect foundation. Speak with an IMAGE Skincare provider today to see how I Conceal can work for you or call us at (800) 796-SKIN.